Lasagna is one of my favourite foods during the holiday season. 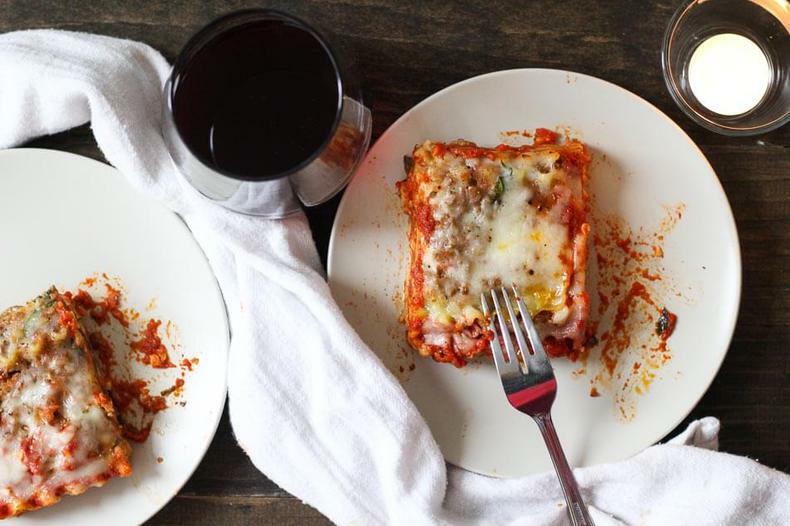 It's so comforting and reminds me of cozy nights in with my family, and I don't know about you, but my family has always kept a frozen lasagna on hand during the months of November and December in case of an impromptu dinner party or unexpected guests. So when I went to the grocery store to round up ingredients for this dish, I realized that I forgot ricotta! 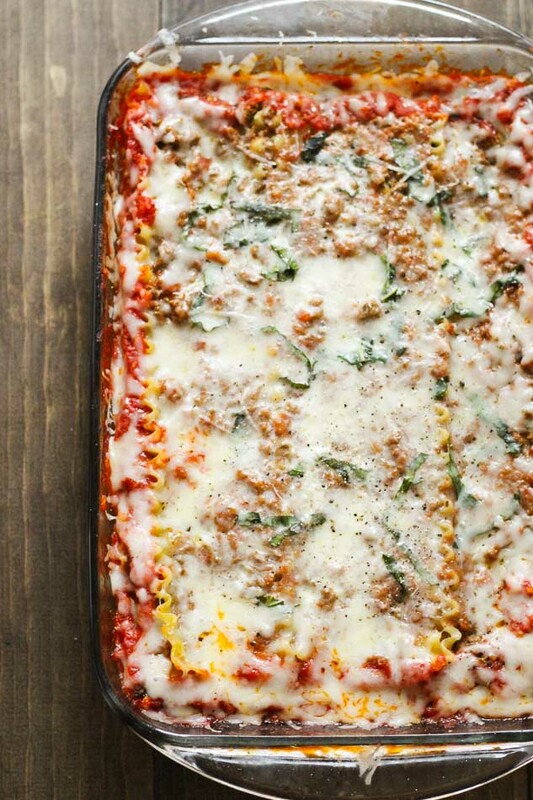 Growing up on those freezer lasagnas, of course I thought lasagna needed ricotta cheese. I mean it's a staple, right? After doing some researching, I stumbled onto this Lasagna recipe from Bon Appetit, which actually advises AGAINST using ricotta in a lasagna. As a lasagna virgin, I loosely followed some of the steps from this recipe and took the magazine's recommendation to instead create a béchamel sauce. Let me tell you, it was the right way to go! 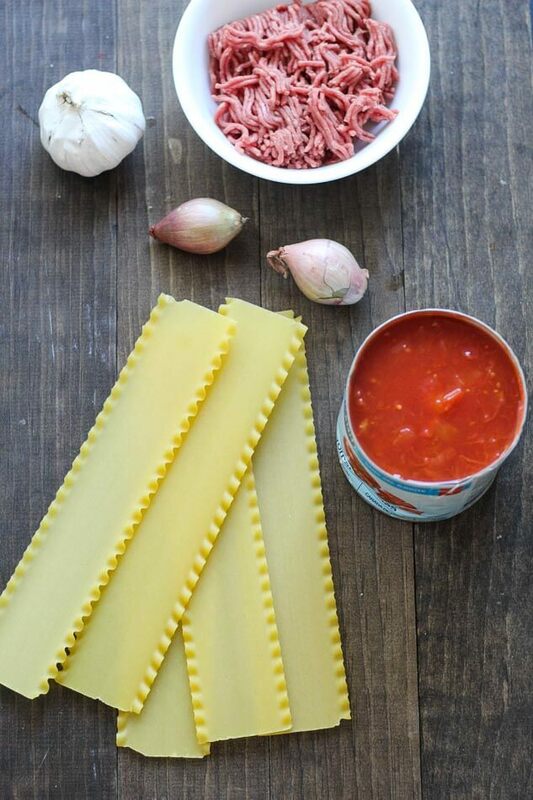 As I mentioned, this Easy Homemade Lasagna is made with 3 Sauces: a hearty bolognese with ground beef, a classic tomato sauce with fresh basil, and the creamy, garlicky béchamel perfectly ties it all together! Being a veggie lover I also roasted some red and yellow peppers and mushrooms as opposed to the traditional spinach, which I hear can water down a lasagna. As a newbie, I didn't want to make any mistakes! 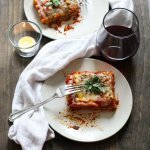 This lasagna is perfect for a night in with the girls, or a catch up with family during the holidays or a special occasion. It is definitely time-consuming (though I must insist it is easy if you love cooking like me and have a couple hours to spare! ), but it is SO worth it – grab a glass of red, sit back and relax, and enjoy the fruit of your labours! The best part about a lasagna, after all, is the fact that you can pre-assemble it ahead of time (up to the day before in fact!) and then just pop it in the oven for 45 minutes and enjoy quality time with your guests while waiting for your dinner. No mess, no fuss. And sooooo delicious. 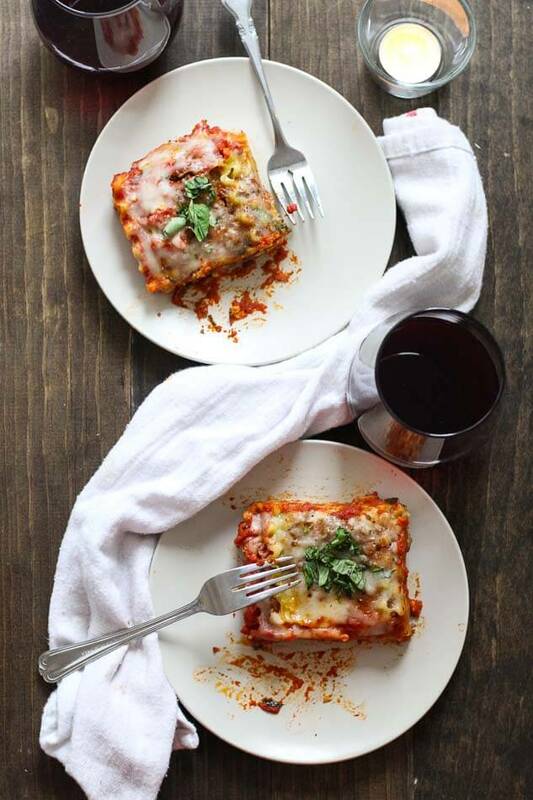 Will you be trying our Easy Homemade Lasagna recipe? If you do be sure to tag us on Instagram and Twitter – we'd love to see your creations for holiday gatherings! 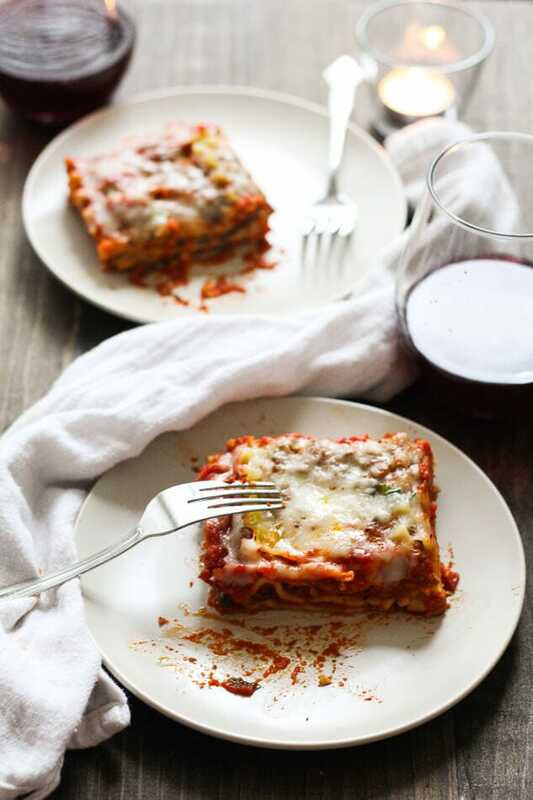 This Easy Homemade Lasagna is made with 3 Sauces: a hearty bolognese, a classic tomato sauce and a creamy, garlicky béchamel to tie it all together! 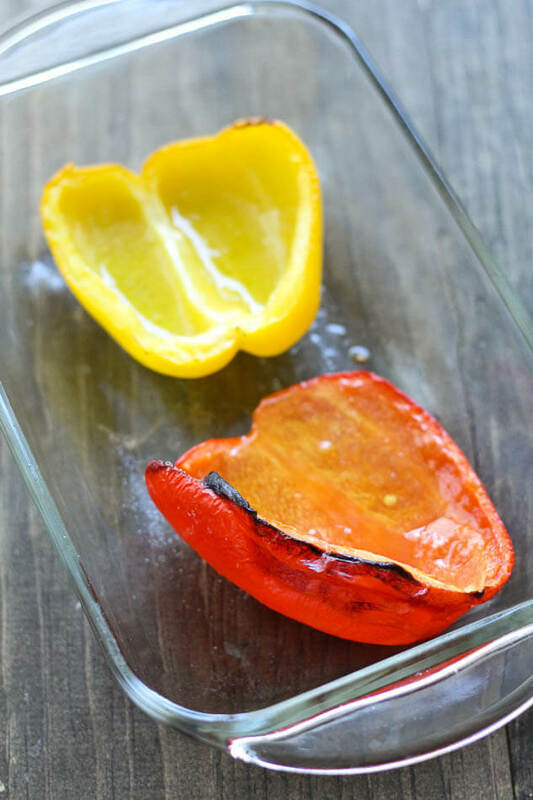 Slice peppers in half and drizzle in olive oil and season with salt and pepper. Add sliced mushrooms and garlic. Cook in the oven for 30 minutes, then remove and chop up peppers. In a blender or Magic Bullet, puree onion, garlic, celery and carrots until fine. Heat olive oil in large pot over med-high heat, and add onion-carrot puree mixture. Add ground beef, seasoning with salt and pepper, and cook for 20 minutes until fat begins to render. Add red wine and cook another 2 minutes, then add crushed tomatoes and simmer for another 10 minutes. Set aside. Melt butter in small pot over medium heat and add garlic, cooking for 30 seconds until beginning to roast. Add salt and pepper, then slowly whisk in flour. Add milk and cream, whisking to remove lumps. Continue until mixture is boiling and then remove from heat. Heat olive oil in a medium sized pot over med-high heat, then add garlic. Saute for about 30 seconds, then add crushed tomatoes, sugar, salt and pepper, bringing to a boil then simmering for 10 minutes. Remove from heat and stir in basil. Coat a 9x13' oven safe dish with butter and olive oil. Add a thin layer of béchamel, followed by lasagne sheets, bolognese sauce, more béchamel, the trio of shredded cheeses and then the roasted veggies. Repeat the same steps four times over, always beginning with the lasagne sheets and finishing with the cheese. When you've added the final layer and before you cover the top with cheese, pour tomato sauce over the top of the lasagna and make sure it goes down the sides of it, covering the entire dish. Finish with cheese and sprinkle some fresh basil overtop if desired. 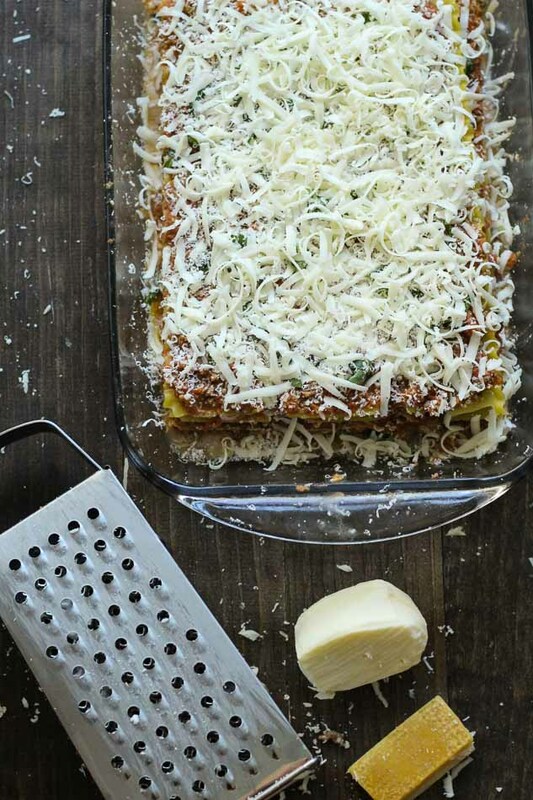 This lasagna can be made up to 24 hours in advance. Cook covered by tin foil at 425 degrees for 40-45 minutes and let stand 5 minutes before serving. Enjoy with a cabernet sauvignon or merlot wine and enjoy! Wow. This looks absolutely divine! I love this type of lasagna – much nicer than the heavier ricotta version. 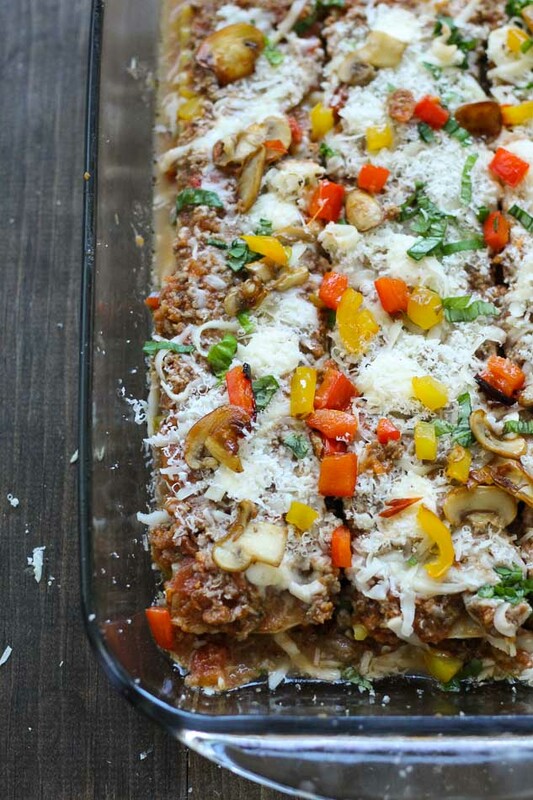 It’s sort of a lasagna cousin to moussaka – and they’re both incredibly tasty. This looks delicious- seriously making my mouth water right now!